If you are expecting a little one or recently brought one home, you have probably heard someone say, “Your whole life is about to change,” “Now your baby is running the show” or something to that effect. Having time to take care of your child and everything else you might have to do on any given day is a serious challenge. Fortunately, some tried and true tricks can help you navigate the murky waters of being a new parent and reclaim some of that precious time. Learn more about how to rock new mom life by reading our tips below. Handling new mom life with ease is all about making things easier and making small changes that add up to having a significant impact. By putting commonly used supplies such as diapers, wipes, and bibs in different places around your house, you eliminate the need to go to the nursery any time you need something for the baby. Additionally, having a little cache of snacks near your most frequent pumping stations means you don’t have to pre-plan whether you will eat while you are pumping, if the mood strikes, you are prepared. In going with the theme of having necessities stashed throughout your house, it’s also advisable to have multiple sets of items you will use every day. In some instances having multiple sets can be prohibitively expensive but if you have the means, it is worth investing in these items to lighten the load. One major item on this list is spare pump parts. Having more sets of pump parts means that you don’t have to wash a set each time you pump and ultimately saves you time and effort that can impact new mom life. Organization doesn’t have to be a big ordeal, but those who are rocking new mom life know that organizing can be a lifesaver. Take clothes for instance. Utilizing a minimum amount of effort to sort them by size and season prevents you from having to dig through everything to find that one outfit that is just right for the weather outside. Similarly organizing your child’s toys and books by age appropriateness allows you to quickly and effortlessly swap them out when the time comes. During the first year of life, children undergo an enormous amount of development. While most of these changes take place while they are sleeping, there are a few things that you can do during the day to assist their development. One of the most important things you can do to help your newborn’s development is consistently doing tummy time with them. This blog is dedicated to the basics of tummy time, and we hope you will find it beneficial. There is no need to overcomplicate the situation because tummy time is just placing your child on their belly and allowing them to explore the world from that position. While they are on their stomach, it is necessary to make sure their arms and legs are underneath of them to help support their body and keep their head off the ground. Make sure that you place your newborn on a low firm surface (blankets are okay too) to help avoid any mishaps or injuries. As your child grows, they will eventually begin rolling over and keeping them low to the ground contributes to keeping them from experiencing a big fall. Tummy time is crucial in helping your baby strengthen their neck and core muscles that are so important for stability while sitting, crawling, standing, and walking. Since your child is not born with the mobility, they will have as a toddler it is necessary to work on building the muscles they’ll require to become mobile. As an added benefit, allowing your child to spend time on their stomach regularly helps prevent positional plagiocephaly (sometimes referred to as a flat head) that is often a result of a baby spending large amounts of time on their back. The session durations for tummy time can differ significantly depending on the age of your child. As their muscles continue to develop, they will be able to stay on their stomach for more time, and longer sessions will become standard. If your infant gets fussy or has difficulty holding their head up, it is advisable to stop your session immediately. Allow your child to rest and recover before their next session. Most expectant parents that have dogs would love nothing more than to have their pup love their baby just as much as their dog loves them. While some dogs will immediately accept a newborn into the “pack,” many dogs require some adjustment that can be a bit trying for the parents. Fortunately, there are some things that you can do to help ease this transition and help your dog learn to love your new baby. Read on to learn our tips for introducing your dog to your baby and building a positive relationship between the two. Since dogs have an exceptionally keen sense of smell, they tend to experience the world most vividly through their noses. You can utilize this fact to your advantage when introducing your dog to your baby by allowing your dog to associate the smell of your newborn with your smell. One practical way to accomplish this task is to bring home an item of clothing that your little one has been wearing for your dog to smell. Since you are bringing the item into the house, the dog will associate the scents on the item with you. Doing this exercise several times before bringing your infant home allows your pup to get acclimated to them before they arrive. While you have been in the hospital, your dog has likely spent large expanses of time alone in your home and will certainly have missed mom and dad. For many dogs, the arrival of their parents can cause them to get very excited and if you add in the new smells and the presence of additional family can be a lot for your pup to process. To help keep their stimulation in check, try to have people enter the home a little bit at a time and let your dog get settled before introducing your dog to your baby. This allows your dog an easier opportunity to process the presence of your newborn. After introducing your dog to your baby, it becomes important to create a strong bond by providing positive experiences for both parties. One of the best ways to do this is to make sure that you provide your pup with plenty of praise when they interact positively with your baby. Praising them provides strong reinforcement for desirable behaviors and is a practice that is common when training dogs. It’s not uncommon for new parents to get a bit of cabin fever after bringing baby home from the hospital. It can seem like you spend all of your time at the house or indoors if either of you has returned to work. While many parents love the idea of getting out and about with their little one, most don’t know what to do or where to go with their infant. Continue reading to learn a bit more about three of our favorite San Francisco baby activities to help keep you from going stir crazy. Playgrounds are at the top of our San Francisco baby activities list because they are plentiful in and around the city. They also often offer a variety of activities and easy access for parents with strollers or carriers. The Golden Gate State Park’s Koret Children’s Corner is one of our favorite playgrounds because there are large grassy areas that are perfect for some outdoor play, a stroll with baby in tow, or a little picnic for your family. The Park also offers a unique concrete slide, rope climbing structure, and historic carousel which makes this a great stop for parents with older children. Gardens are another great addition to our San Francisco baby activities list because they offer some incredible scenery to take in while you enjoy the fresh air with your baby. If you are planning to stop by Golden Gate State Park, the Conservatory of Flowers is well worth your time with its butterfly garden as well as indoor/outdoor gardens. If you want to venture into the heart of the city, Yerba Buena Gardens not only boasts beautiful gardens but also has museums, an Ice Skating Center, Bowling Alleys, and plenty of free outdoor performances, so there is always something to take in as you explore the grounds and their surroundings. If you’d prefer to take a walk on the wild side, the San Francisco Zoo & Gardens is a 99-acre park with seven unique areas featuring animals from all over the world. The inherently child-friendly atmosphere of the zoo makes it one of our favorite San Francisco baby activities. In addition to the animals, there is also a Sensory Garden located in the Fisher Family Children’s Zoo portion of the park. Older kids may also want to take a ride on the miniature steam train or enjoy the onsite playground. No matter what you choose, you can’t go wrong with this one. Located in the Lower Pacific Heights neighborhood of San Francisco, The Mindful Body was one of the first wellness centers in the city. Their San Francisco prenatal yoga classes are designed to help you and your body prepare for childbirth. Partners and caregivers are welcome to attend their classes and expecting mothers in all stages of pregnancy are welcome. For those looking to get outside of the city for their yoga classes, Soul Sanctuary offers one-on-one prenatal and postpartum yoga classes. Located approximately 30 minutes north of San Francisco in San Anselmo, they pride themselves on providing time and space for mothers to explore the changes their bodies are going through. For those who working expectant mothers, Satori offers San Francisco prenatal yoga classes in the city’s financial district. They utilize small class sizes as a means of maintaining intimacy while fostering a sense of community. They host yoga class informational sessions on Monday, Wednesday, and Friday afternoons to offer you an opportunity to see first hand what they are all about. Yoga Tree has locations across the city of San Francisco and their classes are designed to help reduce the pains associated with pregnancy. They offer a nurturing and supportive environment with instructors that are focused on helping you make the most of your pregnancy and preparing you for labor and delivery. The classes and positions are focused on developing your ability to use special breathing techniques as well as opening the hips which is perfect preparation for birth. Located in the heart of San Francisco, Yoga Garden guarantees that “your pregnancy, birth, and recovery will be improved by a regular yoga practice at their studio. This San Francisco prenatal yoga studio offers instruction that is safe for all fitness levels that follow the American Medical Association's “Guide for Exercise During Pregnancy.”Guide for Exercise During Pregnancy.” and focus on providing mother and baby benefit from postures that don’t produce strain on your muscles. Colic - Help! My baby won’t stop crying! Sometimes, a baby will cry for hours on end leaving parents concerned and exhausted. This condition is called “Colic.” Colic and excessive crying accounts for one of the most common reasons for visiting the pediatrician in the first four months of a baby’s life. If your little one is experiencing Colic, we are truly sorry you are going through this difficult transition period, we know it’s never easy. Continue reading to learn more about what Colic is, how to minimize the crying, and stress relief tips for parents. To the dismay of parents and doctors alike, the exact cause of Colic is unknown. It has long been believed that Colic is the result of gastrointestinal discomfort but there is very little science or evidence to back this (or any other explaination) up. Colic is not known to have any long term effects on babies and is a self limiting condition that often resolves on it’s own by 4-6 months of age, but we know those are six long months. The diagnosis criteria for Colic is excessive crying defined as more than 3 hours a day, 3 days a week, for 3 weeks or more. You may also notice symptoms such as excessive gas, pulling the knees to the belly, high pitched and piercing cry, or clenched fists. If you believe your little one is suffering from Colic, you’ll want to document symptoms and bring them up at your next pediatrician appointment to rule out any other conditions that may be present. Unfortunately, Colic isn’t a “one size fits” all condition so you may need to try a few different tips or a combination of tips to get your little one to calm. Be sure to try a few tips below but sometimes there’s just nothing we can do for little ones with Colic and showing them love and affection through the crying may be all we can do. Having a baby that cries for hours on end is exhausting. It’s concerning, frustrating, guilt inducing and terrible. If we’re being honest, you’ve probably found yourself crying too. It’s understandable and you’re not alone! You may even be feeling a little bit depressed. Try a few tips below to feel better yourself. Get professional help- if you think you may be suffering from postpartum depression reach out to your OB or find a therapist to help you feel better. 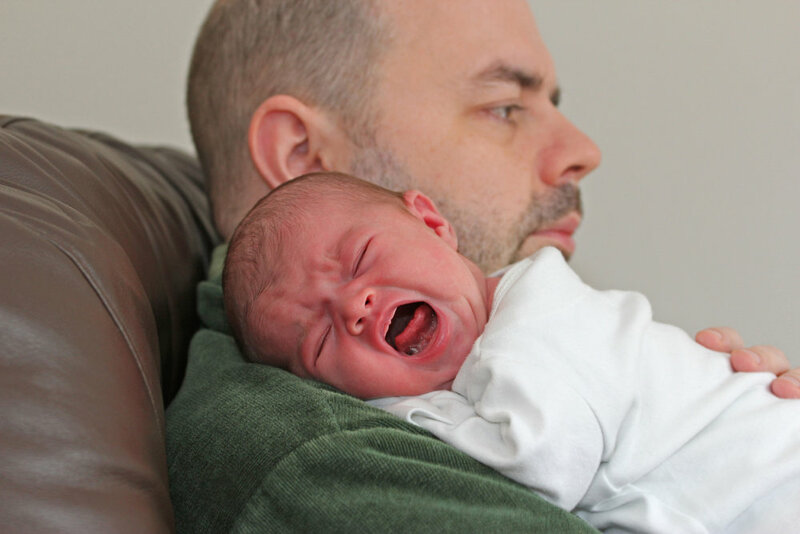 We hope that this blog provided you with some insight on what colic is and how to (hopefully) get you and your baby feeling better! If you are ever so frustrated that you feel like you may shake your baby, place them in a safe place and take a few minutes to yourself to regain your composure.